2 weeks ago, I showed you something quite interesting – fragrance incense paper – a strip of paper you burn to release the scent into the air, which helps fragrance a small area like a small room. It was by Maison Francis Kurkdjian – a luxury perfume house that has just opened its proverbial doors on our shores exclusively only at Metrojaya stores at Midvalley Megamall and The Curve. For Monsieur Kurkdjian, fragrance isn’t something you just spritz on as you go out the door. It embodies the scents of a day from morning to evening. 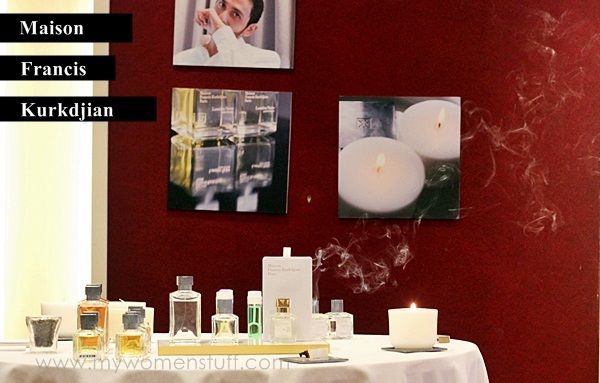 And his range of perfumes and products reflect that belief. His popular perfume is Aqua Universalis – a fresh scent with a fresh citrus top note that dries down a little muskier. It is a scent for men and women and its very interesting and different. I like the light citrus notes and to my surprise, it does last quite a while before the woodsy scent emerges. The MFK perfumes come in heavy square bottles and the tarnished looking stoppers are actually made of zinc to represent the rooftops of Paris where Francis Kurkdjian lives. The heavy glass bottles are luxurious to feel and the heft reflects it. Lumiere Noire (a femme fatale heavy evening fragrance with spicy rose and patchouli favoured by Catherine Deneuve – and incidentally, me!) This is my favourite of the lot, despite the heaviness of the scent. 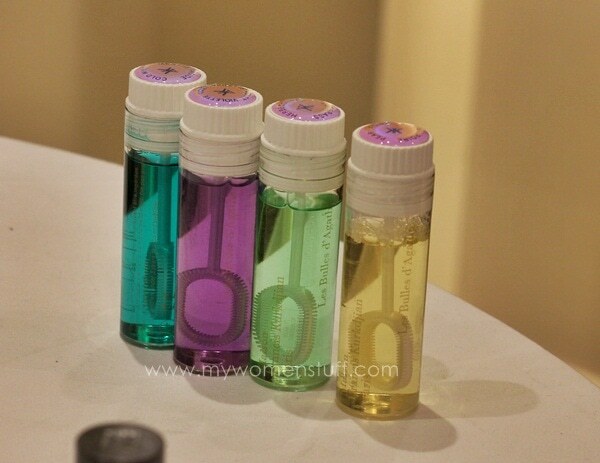 We were led through each of the scents during the press launch and by the end of it, my nose was left reeling. I know I liked the smell of Lumiere Noire and I will save up for a bottle some day but at this point in time, I can’t tell you much about the others. Sorry! You’re going to have to go and smell it for yourself. There are also conventional home items like home fragrances (RM210/70ml) in APOM and Lumiere Noire, candles (RM260) in all scents, and a perfumed leather bracelet (RM925) which was inspired by Marie Antoinette and the past when treated leather was fragranced with one’s favourite scent to mask the smell of urine that they use to treat leather. Erm. Ok. But I just have to show you my favourite item in the range, after the incense paper. Its perfumed bubbles called Agathe’s Bubbles (RM70/45ml) and comes in 4 scents – Poire (pear), Menthe Froide (cold mint), Herbe Coupee (cut grass) and Violette (violets). These perfumed bubbles were created for children and perfumed bubbles seem to feature a lot of Monsieur Francis Kurkdjian’s creations. He perfumed the Gardens of Versailles with orange blossom in 2006 and he has used his perfumed bubbles in numerous installations worldwide from the Shanghai Expo 2010 to filling the Grand Palais, Paris with scented bubbles for Noctambulles. These bubbles are beautiful stuff. Pretty much soap bubbles, when the bubbles pop, they release the scent of whatever they are scented with into the air in a heady sort of way. I absolutely loved it! There was a demonstration of the Poire (Pear) scent on press day and I swear everyone just turned into 7 year olds for a few minutes. I got a bubble on the tip of my nose and when it popped, my nose was filled with the smell of sweet pears. I could almost imagine myself biting into a soft sweet pear, its juice dripping down my fingers. Beautiful! And So. Much. Fun! I was so tempted to buy a bottle just to be frivolous. I just might some day. PREVIOUS POST: What’s so special about the Shu Uemura Hard Formula Brow Pencil that gets it a repeat review? But otherwise, I was very intrigued with the fragranced laundry detergent and softener – just think, if I washed all of my clothes with that, no need to spritz on perfume after and it would be my signature scent! LOL. Perfumed bubbles? More and more bizarre things are coming out in the market these days… but the idea intrigued me, I must admit! It is so much fun! I mean kids would love it but so would adults LOL! If you can view any videos of the perfumed bubbles installations done by Mr. Kurkdjian, do view them. They are lovely! Indubitably! I loved the bubbles! Scented bubbles! Love the idea, curious enough to go have a look but not generous enough to fork out the price. Hehehe… Thanks for the post Paris! Informative and interesting as usual. i am gonna get one of my guy friends to buy me the pear bubble. i want! You’ve gotten me intrigued enough to actually want to plan a trip down to check out the fragrances. The bottles are so simple and rustic. I love the bottles and the bubbles. Such fun! I’m recently in a fragrance phrase. Very bad for my pocket. Worst than being a makeup addict coz generally niche fragrances are so much more costly. Checked out Chanel’s Jersey today and I’m in love. But at over $400 for a 200 ml bottle, I’m holding back for now. dang..those bubbles look like a lot of fun! 😀 I’d love to try that sometime though…time to save up! killed my pocket for a set of acqua universalis EDT 70ml and a 150ml shower gel at an offered price of rm499 for both n i got myself a a violet bubble as GWP! what a steal! d real price wud have reached around rm900+. got them from isetan klcc. they’re holding this sale until 16th of june! go grab them! Yes of course.. my brother in law worked with MFK team.. i love the range of their perfumes..the scent is quite unique and when i tried it, it felt expensive & long lasting.. Saving some to buy the perfume soon..